Past years Educator of the Year and Program of the Year winners! 2019 winners soon to be announced! 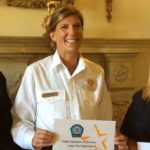 Kathy Hook has been as a Fire and Life safety Educator for the Colorado Springs Fire Department since 2012. She is the primary program lead for two of our largest risk reduction programs, SafetyFactor Injury Prevention Programs as well as our FireFactor Youth Misuse of Fire Programs. She is constantly working to improve these programs, and collect data to show the tremendous value these programs have in our community. As our programs continually evolve, the need to adapt to change is critical. Kathy has kept the programs front and center throughout the state and beyond. To give you an idea of the hard work she has put in, SafetyFactor was presented to 4,443 2nd grade students and FireFactor was presented to 3,534 6th graders. In addition to these programs, she has been an invaluable in the development and implementation of the newest CSFDLink risk reduction programs. 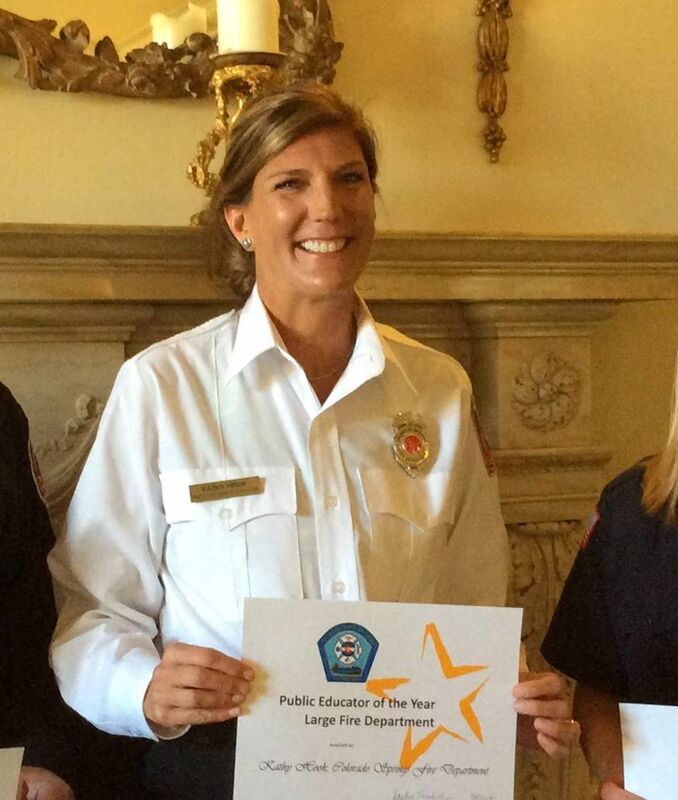 Just this year, Kathy has provided the CSFDLink programs to over 2,800 people, businesses, schools and associations with critical fire and life safety education. In all she has seen over 10,000 people just this year and we have 3 months to go! For her true passion to educate as well as her amazing ability to do anything and everything to get it done, I nominate Kathy Hook as Fire & Life Safety Educator of the year. Jackie has developed, administered, and presented the NFPA Risk Watch Program in the Breckenridge schools for over a decade. The program has been endorsed by the faculty of the schools and is deemed vital to the safety and well-being of Breckenridge school children and their families. Jackie adapted the program for the school-aged kids in the mountain community of Breckenridge by RWB Fire-Rescue. Each month during each school year (for more than a decade), RWB fire professionals present monthly safety topics tailored for their mountain community students. The topics have ranged from burn prevention, home fire safety, wildland urban interface fire safety, fall prevention, bicycle safety, gun safety, as well as prevention of poisoning, and many others. “Firefighter For a Day” camp is one day, 9:30 a.m. to 3:00 p.m., not only educational, but a day filled with exhilarating experiences for children 8 through 13 years of age. Camp was held on Wednesday, August 10th from 9:30 a.m. to 3:00 p.m. The day began with the children participating in warm up activities, to include stretching and light cardiac with our firefighters. There was an emphasis on nutrition and hydration. The activities for the day included learning how to wash a fire engine, the purpose and use of a fire hydrant, donning child size PPE, an obstacle course, building a progressive handline (using wildland firefighting hose line), flowing water to knock down a target, what’s in our EMS kit and what the items are used for, Slip N’ Slide and water ball. This camp was educational through both presentation and hands on. Fifty two (52) children participated in the days activities; during lunch they consumed more than 13 large pizzas and maintained hydration by drinking several cases of bottled water throughout the day. Consideration was taken for children with allergies and medical concerns. Based on firefighter staffing registration was capped. We received community support from Hay’s Market, Berthoud Brick Oven Pizza and Subs and the Division of Fire Prevention and Control (staffing from the State Type 6 housed at our headquarters station). A local high school PE/Health teacher approached MVFR about teaching CPR to their Freshman and Sophomore students as part of their health class. The challenge was to create a program that could effectively teach CPR to 30 students in a 90 minute class period. Using a mix of the AHA hands-only curriculum and materials from the Spokane Fire Department, a 90 minute class was created that covers hands-only CPR, AED use, and basic first aid. The program received excellent feedback from students, faculty, and parents as well. After a successful pilot at one school in 2015, it was brought to two additional schools in 2016 and will reach over 1000 students over the course of the 2016-17 school year.